Five years after it opened, the Creation Museum in Petersburg, Ky., still gleams, and life-size dinosaurs still tread the Earth, shoulder-to-shoulder with humans. But behind the scenes, one of the most ambitious efforts in America to counter evolutionary theory has hit a roadblock. When you walk into the Creation Museum, one of the first things you see is an exhibit of a doe-eyed human child crouched next to a velociraptor dinosaur. The two seem not at all surprised that their epochs have collided. Homo sapiens and velociraptors missed each other by a good 65 million years, according to most scientists, but in the world of the Creation Museum, humans and dinosaurs were created on the same day 6,000 years ago, coexisting peacefully in the Garden of Eden. A thousand years later, a 600-year-old man ushered them onto Noah's ark. Answers in Genesis, a ministry founded in Australia, built the Creation Museum. The group seeks to convince others that the theory of evolution is wrong and that the account of creation told in Genesis is literally true. The result: a place that resembles a slick and entertaining natural history museum, even as it peddles the exact opposite message. Now, the people behind this museum are looking to erect something much bigger: a 160-acre park with a life-size replica of Noah's Ark built to stand 500 feet long and 80 feet high. They're hoping to tap four teams of Amish builders to construct this giant ark, which would become the largest timber structure in the country. Including parking and other areas, the entire Ark Encounter would sit on 800 acres about a 40-minute drive away from the Creation Museum in northern Kentucky. But the ark plan now finds itself on troubled waters. The group initially announced that it expected to break ground on the park in 2011, before eventually pushing that date back to 2014. But in June, in an interview in the Creation Museum's "Noah's Cafe," Ark Encounter vice president Michael Zovath told Yahoo News that the group no longer has a date in mind for the construction to begin. It has been unable to raise sufficient amounts of money, despite pleas to the Creation Museum's visitors to donate to the project. "Fundraising is really tough," Zovath said, blaming the recession. "It's not moving so fast as we hoped." The private LLC that is building the park would need to raise another $20 million before it can break ground, he said. So far, it's taken in $5.6 million in donations and $17 million in private investments. The Supreme Court has ruled that it's illegal for creationism to be taught in public schools, as a violation of the separation of church and state, so public school field trips are out. But the museum still draws in plenty of school-age kids as visitors, in part by focusing on dinosaurs and savvy marketing campaigns. The museum has more than 100 billboards up around the country featuring cartoon dinosaurs urging drivers to make the trip. "It's a way to get kids to come to the museum, that's the whole purpose of advertising," Zovath says of the ads. "The common response is, well, you're trying to attract children to your museum so you can teach them something we don't believe in. That's probably true," he concedes. "But secular museums and most natural history museums, when they run a dinosaur exhibit it's to promote attendance, and they're trying to teach kids things we don't believe in." He added: "We have a message we want people to see, and the only way they'll see it is if they come to the museum." In fact, many already agree with the message. About 46 percent of Americans think God created humans in their present form, while 32 percent say humans evolved, but God helped the process along, according to a recent Gallup poll. Fifteen percent think humans evolved and God had no part in the process. Once the Ark Encounter is built, Zovath is hoping 1.6 million people will flock to it in its first year—and boost the Creation Museum's attendance, too. These projections, based on an outside consulting firm's analysis, helped score the park tens of millions of dollars in tax breaks from the state of Kentucky. Ark Encounter will be a "Biblically themed attraction," not an amusement park, although there is one ride. "It's an indoor ride ... taking guests through the history of Israel from the call of Abraham and then Moses through the 10 plagues, and it ends with kind of a fun ride through the Red Sea as the Red Sea parts," Zovath says. Visitors are then deposited in a "first century village," to see what life was like when Jesus lived. One Creation Museum visitor, Dennis Stevenson, a pastor in Lakewood, Wash., told Yahoo News he hopes Ark Encounter gets built, and he would definitely make the trip again to see the park. Stevenson teaches an adult class that covers Genesis as part of his ministry and has followed the creationism/evolution debate for years. "It's a subject I'm quite interested in," he said. "I just finished building my own six-foot model of the ark for my class." In the gift shop, you can buy kids' T-shirts that say, "On the Sixth Day, God Created Dinosaurs!" or a book by Creation Museum founder Ken Ham titled, "The Great Dinosaur Mystery Solved." Sometimes, the museum tackles evolution and its huge disagreement with science head-on, through exhibits on Charles Darwin and the Grand Canyon. At other times, certain displays seemed to entirely ignore the scientific consensus on an issue. A show on finches, a small type of bird that helped Darwin first hypothesize that one species of animal could turn into many different species, doesn't mention their key role in his scientific discovery. "Scientists are puzzled how so many finch species could arise, displaying such a vast array of traits," the exhibit reads. "The Bible provides the explanation. In the beginning of time, six thousand years ago, God created every kind of bird, including the finch kind, and He gave them the ability to 'multiply upon the earth.'" 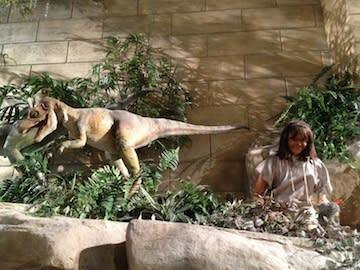 But many visitors—even the littlest ones—seemed very familiar with evolution. When I visited in June, a girl who looked about 10 years old rushed up to an exhibit that showed a giant hummingbird. Next to it, in shadow, were three other creatures—a pterodactyl, a bat and a small finch. "Look, this is evolution!" she said, pointing at the four creatures. Her mother jerked her head around and walked up behind the girl. "You know what, honey? Those are just other animals that are designed to fly," she said, pointing at the exhibit's description. "Oh," the little girl said, embarrassed she'd gotten it wrong.